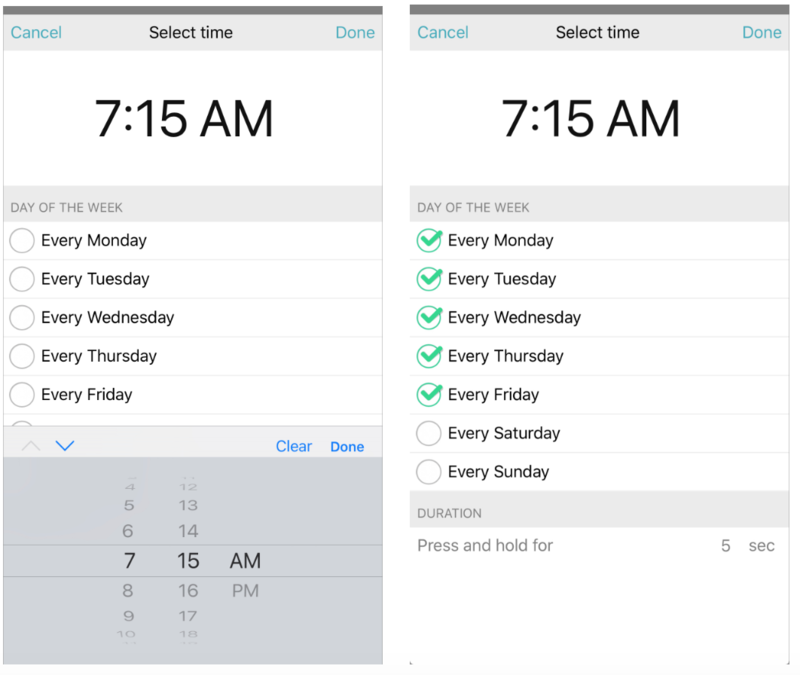 It is possible to schedule a timer so that your MicroBot Push presses/pulls a button at a specific time and day. 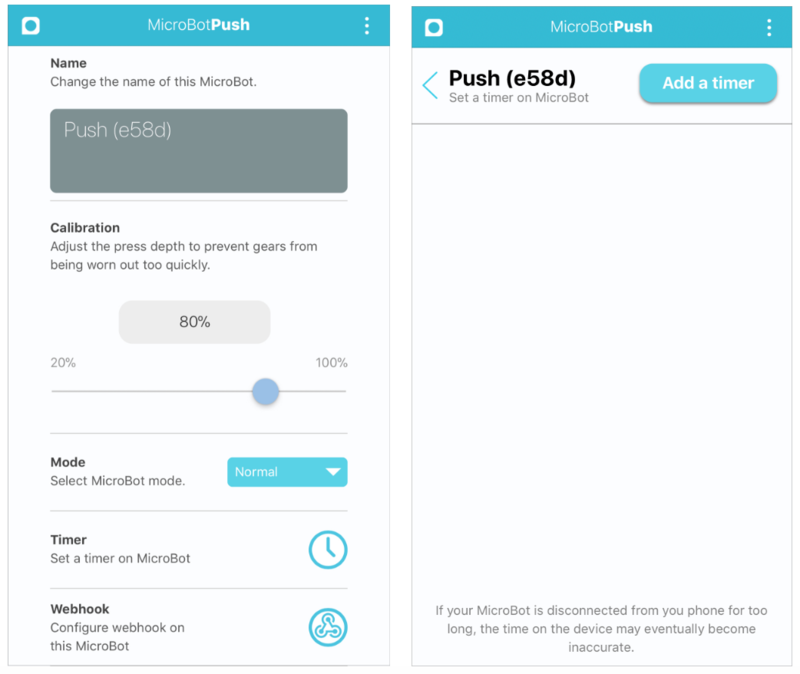 Currently, while setting, editing or deleting a timer, your MicroBot Push must have a direct connection with your phone: the UI will show 'Direct' (opposite to 'Remote'). So, make sure that you are close to your MicroBot Push when setting, editing a timer. Access Timer. Tap on the 3 dots [...] at the top right corner to access your Push's settings, find 'timer' in the list of features, and tap on the 'Clock' icon. Then, select 'Add timer'. Set timer. 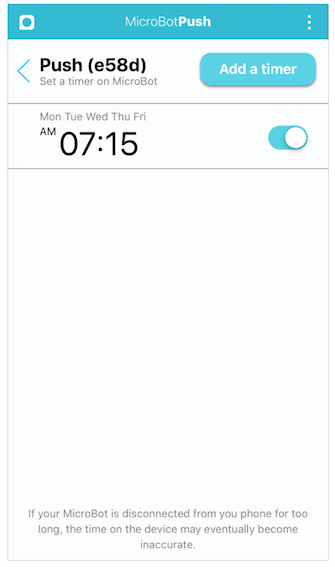 Tap on the time, day(s) and duration (if relevant) to set your timer. Then, tap on 'Done' at the top right corner to save. Note: If you don't set a specific day, it will be automatically executed on the closest time. For instance, if you set 7:00 PM at 6:00 PM, it will be executed 7:00 PM on the same day, and if you set 7:00 PM at 8:00 PM it will be executed 7:00 PM on next day. Once set, your timer will appear in the list of set timers. Tap on the 3 dots again to go back to your MicroBot Push's homepage. Note: You can set up to 5 timers per MicroBot Push. Edit a timer. Tap on the 'Clock' icon in your MicroBot Push's settings, find the timer you wish to edit in the list of set timers, then click on it. Edit, and save as done previously. Delete a timer. 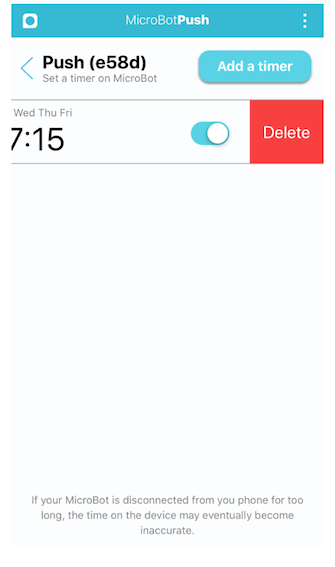 Tap on the 'Clock' icon in your MicroBot Push's settings, find the timer you wish to delete in the list of set timers, then slide from right to left to make the 'Delete' button appear. Tap 'Delete', done!